There are now over 104,000 people living in Ireland with a cancer diagnosis. Using The Irish Longitudinal Study on Ageing (TILDA), healthcare utilisation of cancer survivors (aged 50 +) was compared with those without a history of cancer across service providers. Our cancer variable was stratified by time since diagnosis (2-5, 6-10, 11+ years) and type (breast, prostate, colorectal and a miscellaneous group of ‘other’ cancers). While the probability of cancer survivors accessing GP services was not significant different to respondents without a history of cancer, the probability of an outpatient specialist office visit was 19.5, 11.8 and 14.0 percentage points higher, respectively for those 2-5years, 6-10 years and 11 years or more after their cancer diagnosis and was statistically significant. In Ireland, the pattern of GP and specialist use appears less well defined compared to other European countries. This suggests an overarching policy response is required for cancer survivorship care. As in most industrialized countries, the outcomes of those with cancer in Ireland have improved steadily over the last 20 years. According to the National Cancer Registry of Ireland’s (NCRI) 2013 annual report, a total of 104,300 patients with a cancer diagnosis since January 1994 were still alive at the end of 20101. The average survival within five years of diagnosis has gone from 42% in 1994-1999 to 60% between 2005-2009 for men and from 52% to 62% for women1. It is perhaps unsurprising that cancer is now viewed as the “new” chronic condition2. Survivors are, however, at increased risk of second primary cancers and other health conditions such as diabetes and osteoporosis as well as having poorer functional health status3. This can pose challenges for delivering appropriate healthcare services for their unique needs4. It is projected that the number of people living with a cancer diagnosis in developed countries will continue to increase in the coming years as a result of many factors including the ageing population and improvements in medical treatment5. Internationally, a number of studies have examined patterns of health service utilisation during the survivorship phase6. Differences between healthcare systems in terms of entitlements to publicly funded care complicate international comparisons. Ireland has a mixed public and privately funded healthcare system. Citizens are entitled to treatment within the public system. However, those with a medical card which, at the time of the study, was means-tested in those under 70 years of age and universal in those 70 years of age and older, did not pay a contribution for visiting their GP (average cost of €50), emergency and outpatient (€100 unless referred by GP), inpatient or day case (€75) or the full costs of prescription medications7. Private health insurance provides mostly supplementary coverage (e.g. faster access to specialists & treatment in private hospitals), based on a GP referral8. Also important in any study of cancer survivorship is the time since diagnosis, as well as type of cancer. In this paper we examine patterns of service use over the course of the survivorship phase. It is to the best of our knowledge the first paper of its type examining this issue in Ireland. The objective of the study is to examine the relationship between service and cancer status as well as the pattern of service use among those with a history of cancer post diagnosis. Data from the first wave of The Irish Longitudinal Study of Aging: TILDA (2009) were used in the analysis. TILDA is a two-stage clustered survey of a representative sample of the population aged 50 and older in the Republic of Ireland. In total, 8,504 computer-aided personal interviews were conducted with individuals in 6,279 households giving a response rate of 62%. More detail on the sampling methodology and data collection used in TILDA can be found elsewhere9. TILDA is a comprehensive survey which consists of thirty-seven questions about healthcare utilisation in the last twelve months. A respondent with a history of cancer was identified with an affirmative response to the question “Has a doctor ever told you that you have any of the following conditions? The list included cancer. Subsequently, respondents were then asked about the type of cancer and the age at which they were diagnosed. Time since cancer diagnosis was calculated by subtracting age at diagnosis from age at time of survey. We grouped cancer survivors by time since diagnosis as 2-5 years, 6-10 years, and 11 or more years; the groupings were informed by an US study10. Choice of explanatory variables was informed by data availability and by the Andersen Behavioural Model (ABM) of predisposing, enabling and need characteristics of healthcare utilisation11. In our principle analysis, we employ a series of hurdle models that imply that the count measure of healthcare utilisation is a result of two different processes. The first part specifies the decision to seek care using a logit model, and the second part models the amount of healthcare for those individuals who receive some care using a zero-truncated negative binomial model. This two-part model can be interpreted as a principal-agent type model, where the treating doctor determines utilisation on behalf of the patient once initial contact is made12. Thus, it is assumed that the decision to seek care is taken by the individual, while the level of care depends on physician input. This is essentially the benefit of the hurdle model. For example, a higher level of utilisation by cancer survivors of outpatient office visits may be suggestive of supplier-induced demand. From the 8,504 respondents in the dataset, 329 (3.87%) patients younger than 50 years of age, and 64 patients (0.75%) with missing demographic data were excluded. Five hundred and eleven (6%) respondents with a history of cancer that either reported that their cancer occurred at a time in the future, or 9 (0.1%) did not know, or 6 patients (0.7%) with more than one cancer diagnosis were excluded. We assumed that 92 patients (1.1%) who reported that their cancer diagnosis within 2 years were still undergoing active treatment and were also excluded. 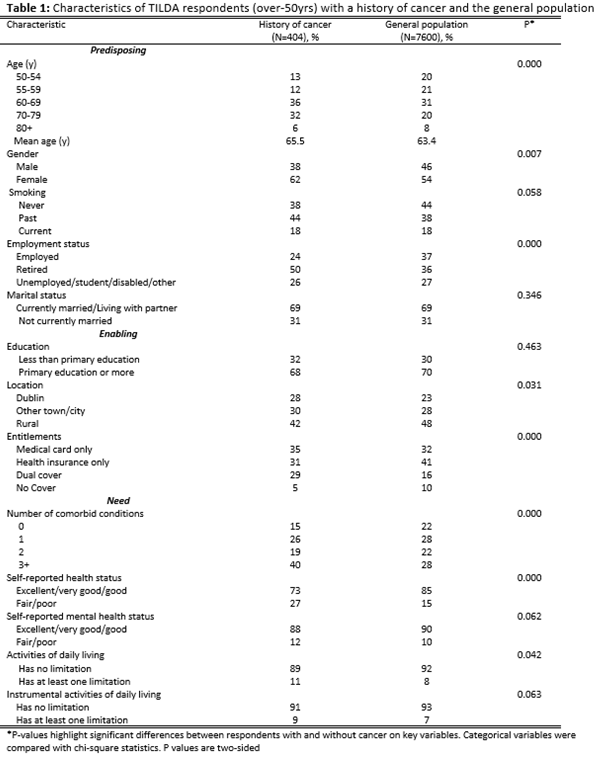 Compared to their general population peers, those with a history of cancer are statistically significantly more likely to be older, retired, from a rural area, possess dual cover of both a medical card and private health insurance, have more chronic conditions and self-report to have worse physical health status and more likely to have limitations of daily living (Table 1). As can be seen in Table 2 and consistent with intuition those who survived with a history of cancer were more likely to use a range of services than those with no cancer history. In multivariate analyses the most interesting and consistent findings emerged in respect of GP and outpatient services. 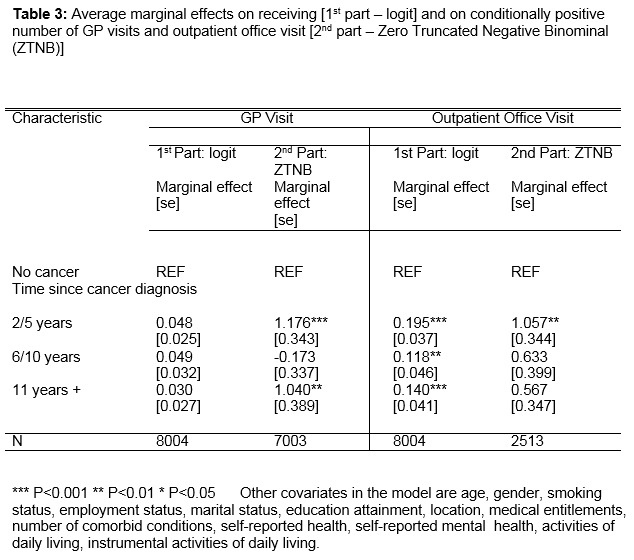 The coefficients in Table 3 are the average marginal effects for the hurdle model of GP and outpatient office visits. Respondents with a diagnosis of cancer within 2-5 years are statistically significantly more likely to seek care and use more outpatient specialist services than those without a diagnosis of cancer. While these effects dissipate over time, the probability of an outpatient specialist office visit is 11.8 percentage points higher for those 6-10 years and 14.0 percentage points higher for those 11 years or more after their cancer diagnosis than respondents without a history of cancer. The level of GP visits and not outpatient office visits, as determined by the 2nd part of the hurdle model, is statistically significant for those 2-5 years (117.6 percentage points) and those 11 years or more (104.0 percentage points) after diagnosis. Using the same models as in Table 3 but stratifying by cancer type, the results across specific cancer types reveal a similar pattern. While the results with respect to the other variables are not the focus of the paper, it is noteworthy that they are consistent with expectations in terms of the signs and significance of estimated marginal effects and with findings of others in the Irish context13. Indeed, it is the increase in the number of comorbid conditions that has the strongest effect on utilisation. In Ireland, 85% of cancers are diagnosed in people over 50 years of age which makes TILDA an appropriate dataset for cancer survivorship research1. Our hurdle model showed that respondents that have a history of cancer greater than 2 years since diagnosis had a significantly higher probability of having an outpatient specialist visit (but not a GP visit), compared to those without a cancer diagnosis. The 2nd part of the hurdle model predicts that the level of outpatient office visits are only statistically significant in those 2-5 years after diagnosis. Interestingly, the level of GP use is also greater for this cohort. This suggests that respondents with a history of cancer in Ireland will have hospital outpatient visits many years after cessation of primary treatment for their cancer. But also, will have higher number of GP visits than people without a history of cancer. This could be attributed to the fact that up to 40% of cancer survivors develop late-effects in subsequent years following the cessation of their cancer treatments14. Equally it may indicate unobserved characteristics such as preferences or risk adversity on the part of the respondent and/or their GP with respect to their management of their post-cancer treatment care. The recommendation that a ‘whole system’ approach be taken in the analysis of healthcare utilisation of cancer survivors as per the literature is vindicated6. The results presented in this paper suggest that in Ireland cancer survivorship care appears to present an increased burden on the hospital sector. Unlike other European countries, formal guidelines on follow-up care for cancer survivors is absent. The Dutch ‘Cancer Survivorship Care’ policy paper recommends that when no sign of recurrence or ill-health effects after 1-year the patient be referred back to the GP15. A policy facilitated by the fact that it is mandatory for all citizens to have insurance for standard medical care and be registered with a GP16. A Dutch analysis reports that GP attendance by patients with breast, prostate and colorectal cancer increased 2 to 5-years post diagnosis by 24%, 33% and 15% respectively, compared with controls17. A limitation of TILDA is that it is a survey of community-dwelling adults and will miss respondents in institutions including hospitals and hospices. Self-reported responses may be subject to recall bias and detailed information about cancer care is limited. Also, the specific reason for utilisation of the healthcare service is absent. Not enough responders in TILDA allow for meaningful analysis stratifying by interacting time since diagnosis and type of cancer. This analysis, based on 2009 data, suggests that the role of GPs is not well defined in the Irish healthcare system with respect to the management of cancer survivors. The National Cancer Control Programme (NCCP) in 2013 issued a guide for GPs to address the follow-up care of breast cancer without recurrence after five years18. This development will likely result in less oncologist-led care for long-term survivors. In the US, the Institute of Medicine (IOM) proposed the use of survivorship care plans (SCPs) to facilitate coordination of post-treatment care between oncology and primary care providers19. While SCPs are not without problems20, such guidance is absent in Ireland. Therefore, a national policy on cancer survivorship in Ireland similar in outlook to the latest IOM report would be welcomed21. Interestingly, NCRI researchers have recently suggested that substantial savings (€760,000 over 10-years) if NICE guidelines were adhered to in prostate cancer survivorship care22. In conclusion, this analysis shows greater use of secondary care services among long-term cancer survivors than those without cancer; a pattern that continues many years after the initial diagnosis. This could suggest that the transfer of patients with a cancer diagnosis from specialist care to primary care in the survivorship phase in Ireland is not as well defined as other European countries. The absence of a coherent strategy for the management of cancer patients in the survivorship phase, may contribute to this and warrants further investigation. The Health Research Board under their PhD in Health Economics in Cancer Prevention Fellowship program. Fineberg HV. Cancer Survivorship: The New Chronic Condition. Medscape Gen Med. 2006 Mar 13;8:66. Demark-Wahnefried W, Aziz NM, Rowland JH, Pinto BM. Riding the Crest of the Teachable Moment: Promoting Long-Term Health after the Diagnosis of Cancer. J Clin Oncol. 2005; 23:5814–30. Rowland JH, Hewitt M, Ganz PA. Cancer Survivorship: A New Challenge in Delivering Quality Cancer Care. J Clin Oncol. 2006; 24:5101–4. Coleman MP, Forman D, Bryant H, Butler J, Rachet B, Maringe C on behalf of the ICBP Module 1 Working Group. Cancer survival in Australia, Canada, Denmark, Norway, Sweden, and the UK, 1995-2007 (the International Cancer Benchmarking Partnership): an analysis of population-based cancer registry data. Lancet. 2011; 377:127–38. Treanor C, Donnelly M. An international review of the patterns and determinants of health service utilisation by adult cancer survivors. BMC Health Serv Res. 2012; 12:316. Turner B, Shinnick E. Community rating in the absence of risk equalisation: lessons from the Irish private health insurance market. Health Econ Policy Law. 2012:1–16. Whelan BJ, Savva GM. Design and methodology of the Irish Longitudinal Study on Ageing. J Am Geriatr Soc. 2013; 61 Suppl 2:S265–8. Yabroff KR, Lawrence WF, Clauser S, Davis WW, Brown ML. Burden of illness in cancer survivors: findings from a population-based national sample. J Natl Cancer Inst. 2004; 96:1322–30. Andersen RM. Revisiting the behavioral model and access to medical care: does it matter? J Health Soc Behav. 1995; 36:1–10. Zweifel P. Supplier induced demand in a model of physician behaviour. Health, Economics and Health Economics. J. Van Der Gaag and M. Perlman (eds). Amsterdam: North Holland; 1981. p. 245–67. Doherty E, Dee A, O’Neill C. Estimating the Amount of Overweight and Obesity Related Health-Care Use in the Republic of Ireland Using SLÁN Data. Econ Soc Rev. 2013; 43:227–50. Treanor C, Santin O, Mills M, Donnelly M. Cancer survivors with self-reported late effects: their health status, care needs and service utilisation. Psychooncology. 2013; 22:2428–35. Schäfer W, Kroneman M, Boerma W, van den Berg M, Westert G, Devillé W, et al. The Netherlands: health system review. Health Syst Transit. 2010; 12: v – xxvii, 1–228. Heins M, Schellevis F, Rijken M, Hoek L van der, Korevaar J. Determinants of Increased Primary Health Care Use in Cancer Survivors. J Clin Oncol. 2012; 30:4155–60.